Oh another pattern that I haven't seen before!! I have about ten of these Vinewood saucers with a grey print. They have always been stored - not all used mind you - with ten cups, which I realised after visiting the Crown Lynn exhibition in Wgtn, were the Dorothy Thorpe-Mark Cleverly 'Pine' cups. I thought that my mother, who habitually bought up sale remnants must have just matched them together, especially as the grey colour didn't really jell with the exquisite 'Pine' blues. Until I started seeing similar combinations on Trade Me, including one a couple of weeks ago with marked 'Palm Springs' cups on brown printed saucers. Seeing Marl's lovely blue version, I wonder if this is the colour that should go with the Pine cups. It seems to me that this was a way of re-issuing in a more populist way, the surplus Dorothy Thorpe cups. I haven't seen other pieces in the Vinewood pattern, but if the D number has been noted it is presumably on bigger items? 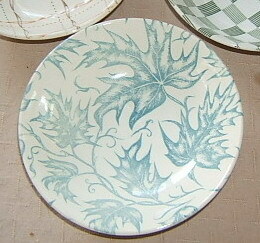 Found that I have this pattern in green ...... but it just has the Genuine Ironstone backstamp. The palette broadens. I have just picked up at a dump shop, a cup without markings (other than Made in NZ) that seems like the Pine ones, but with a matt olive greeny brown outer and a softer speckly green inner. Maybe your green Vinewood was designed for it.